From Calgary, Alberta, Peter & the Wolves hit Vancouver with a new album on VLV Records! Don’t miss this night of good old fashioned rockabilly and rhythm & blues that’ll shake you to the bone and make you wanna jive all night long! 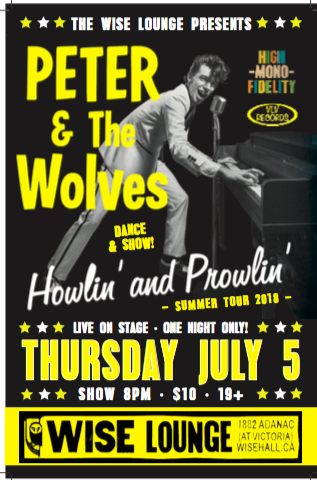 Singer/songwriter Howlin’ Pete Cormier and his Wolves, Jason “Pedro” Lowe and Cody Voyer, will take you on a trip to the golden age of rock and roll. These catchy choruses and hip swingin’ rhythms will keep you shakin’ in your sleep!